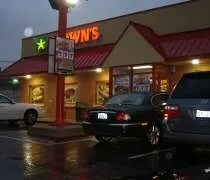 Brown’s has several locations in Chicagoland, but the one closest to where I was is on 111th and Cicero right at the Oak Lawn/Alsip city limits. It’s a really small shop and really hard to get in to. I missed the entrance and had to go up a block and turn around. When I turned in to the very small parking lot, I headed straight one of just a handful of spots in front of the building. They must do a lot of carryout because there wasn’t much to the restaurant. It’s a long narrow space with the order counter in the middle. There are a couple of booths and a table or two on either of end of the building. Sticking with a Chicago tradition, there’s a lunch counter overlooking the busy intersection should you be in a hurry. The thing that really jumped out at me was how clean the store was. Chicken stores are usually greasy and dirty. This store was spotless. I’m not going to say I would eat off the floor, but it was really bright and clean. The menu includes chicken, pasta, hamburgers, hot dogs, and even Italian beef, but I was there to try the chicken. I ordered a two piece white meat meal with one side and a biscuit. Unlike the other big chicken places, Brown’s has french fries so that’s what I got. I tacked on a Pepsi since I was going to eat it there. It ended up costing me just over six bucks. A few minutes later, a tray with my chicken was put up on the counter. I grabbed it then headed towards a booth. I forgot to grab napkins which would become a problem later in the meal. I started with the wing since it was easier to eat. The chicken was hot. Really hot. I set the wing back down and went for the fries while I was giving the chicken time to cool, but they were fresh out of the fryer too. At least I know my food was taken right out of the fryer. The fries were crinkle cut fast food fries. Nothing great, but I loved that they actually had fries instead of the usual sides that I don’t really like. Back to the chicken, I polished the wing off then dug into the breast which was still steaming hot. The chicken was good, but I still say Popeyes has a better flavor. The breading is nice and crispy and there’s a lot of it which is great. The meat has a different texture….something I’m not really used to. The meat is still plenty juicy, but it’s also really tight and dense. At times, it felt hard to chew. It wasn’t like an overcooked toughness so I’m not really sure what it is. I had some cold chicken at J’s parents in the past and it had the same feel. I just thought it was like that because it was cold, but this was warm chicken. Maybe it comes from the reheating in the deep fryer or something. I really don’t know. The biscuit that came with the sandwich was good, but didn’t jump out. Better than KFC’s, but not Popeyes. Brown’s is really good chicken. I could eat it everyday and be happy, but I still think I win the argument on who has better chicken. I love the fact that they had french fries. 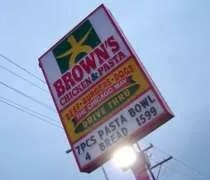 I left Brown’s full and not wanting more which does happen quite often at my chicken restaurant of choice. If you’re in Chicago, this is one of the local chains that you need to try. Brown’s is a Chicago institution and it’s like that for a reason. check again here frequently. I am quite sure I’ll learn many new stuff right here! whether with peers or other footballers. that can beat you in a number of ways.